In 1992, Susanne was sentenced to 30 years in prison. She says she changed while incarcerated and learned how to truly care for and help other people; she was released in 2011 for good behavior. Today, she shares joy with others through her passion of baking. 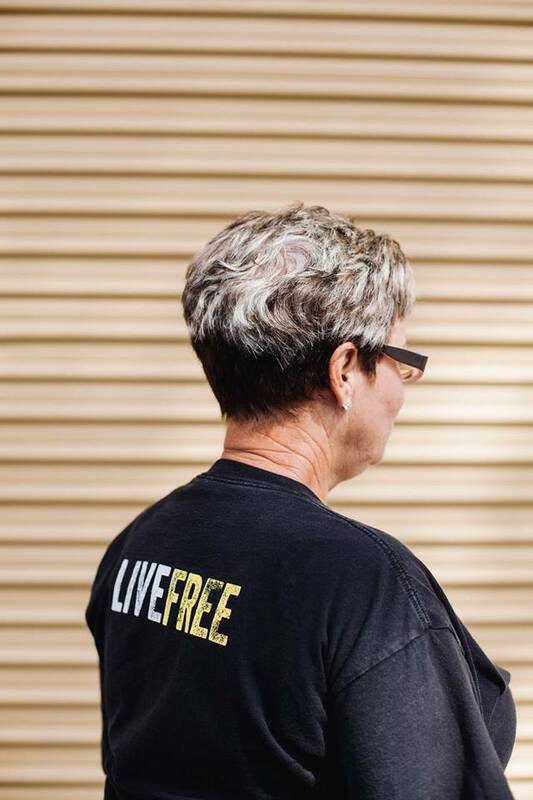 And in part it was that passion - and two dozen cakes she had posted on social media - that landed her a job with the Florida Rights Restoration Coalition, where she assists new returning citizens with their transition back into society. How long have you worked at the Florida Rights Restoration Coalition? A: About four months, and it’s been amazing. Desmond Meade, who is the president here, called me about some of the cakes I was baking after I got out of prison, because I put a picture of one of the cakes on Facebook and he saw it. He asked me to send him 20-25 pictures of my best cakes, and said, ‘You’re a returning citizen and you’re doing good, and I’m gonna promote the hell out of your cakes.’ I told him I hated the job I had at the time, and he said, ‘Come see me tomorrow.’ So I came and I met with him and he offered me a job as a democracy fellow, which was a clerical position. On my 21st day they called me into the office and said, ‘We wanna offer you the position of Re-Entry Coordinator.’ I was just blown away. My mother had always taught me fundamental baking and cooking and things like that, so I’ve been doing that for a while. But I went to prison in 1992. And when I went in, there was no internet, no YouTube, no Instagram, not even MySpace. When I got out, I started baking cakes, baking birthday cakes for my great-nieces. Then I found out that on YouTube you can learn how to decorate the cakes, and that was amazing and awesome. So I watched all those videos. Until this day, I still watch videos on how to do these things and perfect these techniques. And the guy asked me, ‘Why the hell do you care about convicted felons?’ And I told him I am one. How much did you know about community organizing before coming to work at the FRRC? I never knew what organizing was. I never had a clue. And now I’m working with all these amazing people, and getting the chance to meet with all these incredible people and learn from them. We go out and knock on doors and talk to the people, and right now we’re working hard on telling people about Amendment 4. Susanne was arrested in 1992 for Grand Theft and spent 30 years in prison. When you knock on doors, do you tell people you’re a returning citizen? Well, last month I working on something every day for four days, and I was coming home really late at night. And when I came home on the third night, my yard was done, my hedges were trimmed, the weeds were gone, it was edged, everything was perfect. And he came out and he waved, and he said, ‘I noticed you’ve been gone a lot, so I thought I would help you out.” Since then he’s my buddy. If he sees me out there he’ll come over and help me. He has a riding mower and I have a push mower, so he’ll come over and he’ll see me pushing, and he says, ‘I got the rest.’ And he’ll do it for me. I really haven’t had the courage yet to say, ‘So you gonna vote for Amendment 4?’ But I’m working up to it. 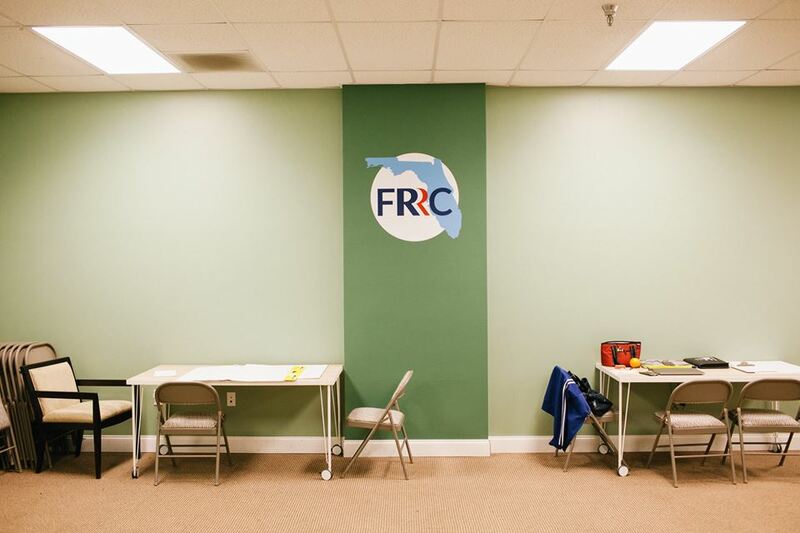 - Is the As the Reentry Coordinator at the FRRC, Susanne helps recently returning citizens adjust and get settled back into society. 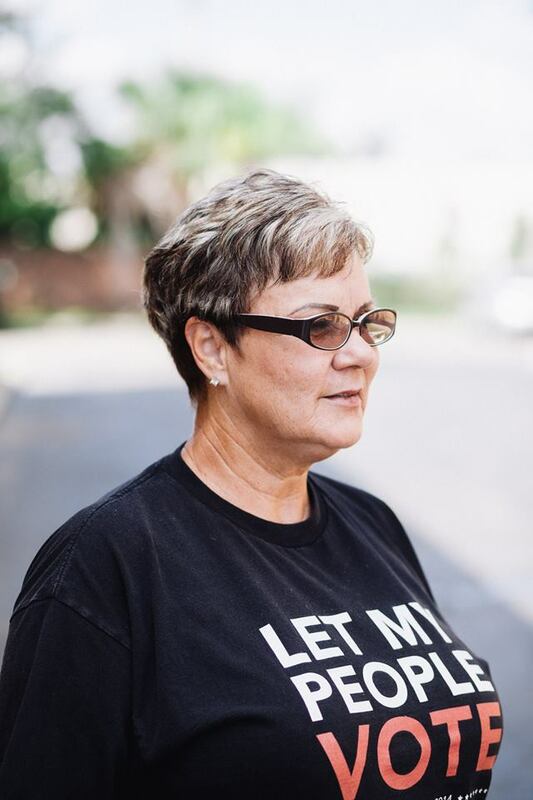 There are about 1.5-1.7 million people who have been convicted of felonies in Florida who don't have the right to vote. What did it mean to you to lose your right to vote? Out of everything that I had to go through, out of everything that I did and everything that I lost, losing my only child and losing my right to vote are the things that were the greatest losses to me. I just don’t have a say in anything that affects me. I have no say at all in who runs our country, or the people I think should run the country. Granted, I made bad choices, and that’s something I hear over and over. Why should we trust someone who made bad choices to make choices for our government, our county, our city, our state, our nation? But my choices were made a long time ago. I’ve changed since then. What do you say to people who have their voting rights but choose not to exercise the right on election day? I have a niece who goes to FIU in Miami who tells me she’s not gonna vote because she thinks it doesn’t matter anyway. Oh my gosh. I try to explain to her how important it is, and I tried to get her to agree to go register to vote to be my voice. And she just won’t do it. I can’t even wrap my brain about not wanting to have a say. I can’t wrap my brain around not following politics, not following what someone believes in, not following their platform. Our lives depend on it.